WOW, the “experts” are everywhere and never cease to amaze! Our readers are used to us bashing them for their cluelessness when it comes to economics and market analysis, but apparently “experts” live in the entertainment critique sector as well. We know that impressions of entertainment are completely subjective, and anyone is allowed to like or dislike anything they choose, but some of these “experts” blew our minds with their critiques of Evil Dead – The Musical! Look through the reviews of this production and you’ll see the nose-in-the-air “experts” enthusiastically pasting “not recommended” all over their critiques. They offer a serious and technical review of the show – ya get that ?– a serious, technical review of evil dead – the musical. How seriously must one take oneself to do that? This is not Phantom, Les Miz, or Madame Butterfly. IT’S EVIL DEAD – THE MUSICAL! Let’s start here; is it lighthearted family entertainment? No. There is overt sexual humor and very coarse language. If, however, you’ve taught your children right from wrong, what is acceptable vs. unacceptable behavior for them, and the difference between real blood and fake blood they’ll be fine, as was the adorable 10 year old girl sitting in the front row of the Splatter Zone for what was apparently her birthday. After that, any hint of “serious” should stop. This production was just plain fun as it was intended, “experts!” We’ve certainly attended many productions that have thrilled the “experts” and walked out disappointed. This show was an absolute blast! We haven’t been that entertained in quite some time. BTW, when I say “we” I refer to myself, my wife, and our 16 year old son. The cast wonderfully overacted the stereotypical B horror movie roles, the voices were great, the dialogue and lyrics were hysterical and the cross-referencing of sequels and original cast were woven in beautifully. Some humor was at an eighth grade, in your face level and some was very cerebral. How could writers and actors be asked for more? Thanks for reading and…stay tuned! 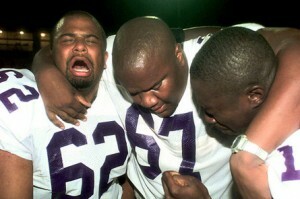 Records were made to be broken, but as we all know some records are the last ones you want to be the one to break. 80 consecutive losses as a football team may be an embarrassing record to hold, but the record this administration broke in September 2014 is far worse than just embarrassing! Wow! This report is worse than last month’s, but it will be hard to break through the manic headlines to find the truth! 248k new jobs. Great! Of those, however, only 236k are in the private sector which keeps us well below our 250k requirement to just break even on those becoming eligible to work each month. The labor force lost almost 100k more members in September 2014 and those not in the labor force swelled by 315k. Yes, 315k. So, 236k new jobs…and 315k left the labor force. See the fraud yet? The work week remained range bound at just 34.6 hours but construction hours fell by .2 hours. That’s big. It’s also the second worst showing of 2014. Hourly wages actually declined. Without fully detailing a diffusion index, we’ll just say here that readings over 50 point to expansion and those under 50 show contraction. Consider the uncomfortable three-month trend in the manufacturing sector’s diffusion index starting in July: 56.2, 54.9, and 51.9. That’s not pretty. All that would be bad enough, but there is one glaring statistic that you will see here and from very few other responsible analysts…the participation rate. 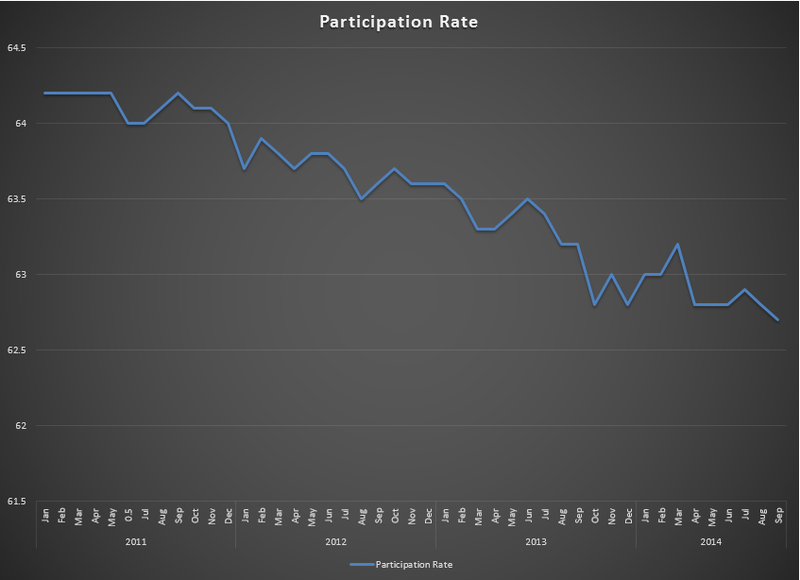 Ladies and gentleman, the available, eligible labor force for the United States of America has set a NEW RECOVERY RECORD LOW PARTICIPATION RATE in September of 2014! 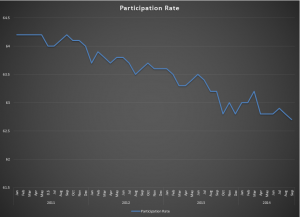 For those of you keeping score, that’s 5 years, 3 months into a “RECOVERY!” The participation rate has fallen to 62.7%, a level not seen since 1978. The sad chart is included below. We say ignorance is curable but stupid is forever. So let’s leave ignorance out of the equation and focus on stupid, then ask what’s worse; stupid or dishonest? We say “stupid AND dishonest!” The participation rate is low because baby boomers have done so well that they can afford to retire early especially since they have access to affordable healthcare under Obamacare?!!? We’re not kidding! You have to go and read the comments under this article from Business Insider. It is UNBELIEVABLE! Sometimes calling someone “stupid” is an insult…to stupid people. Business owners, managers and investors everywhere need to be aware of the realities of this economy. Our governmental leaders are out there telling us the economy is fine and improving. They tell us their policies are working and we are just too ignorant to see it. Believing this rhetoric is nothing short of dangerous to our economic health!